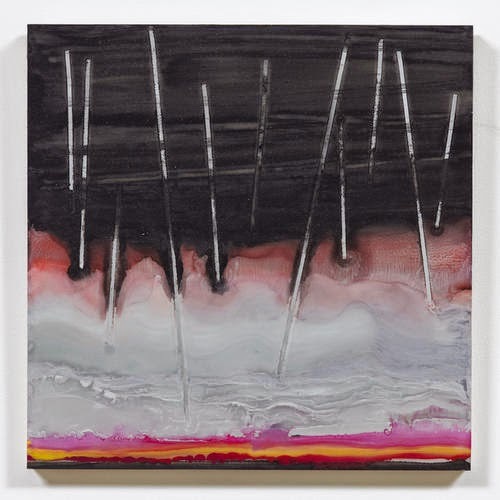 The Internet, especially through social media, facilitates a direct and immediate connection between interior and exterior worlds, and I have little doubt that this recent phenomenon has helped propel the current resurgence of abstract painting. 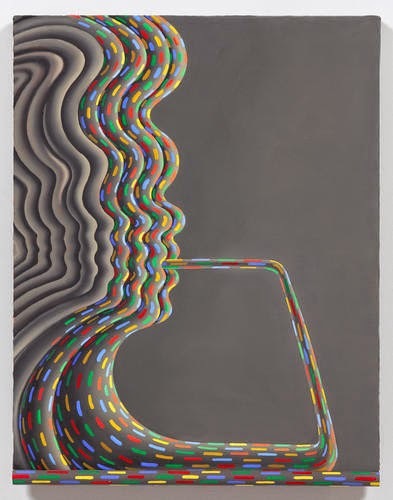 MoMA’s Laura Hoptman-curated contemporary painting survey “The Forever Now” showcases artists who comb the Internet for styles both past and present to ape, reference, and revere. 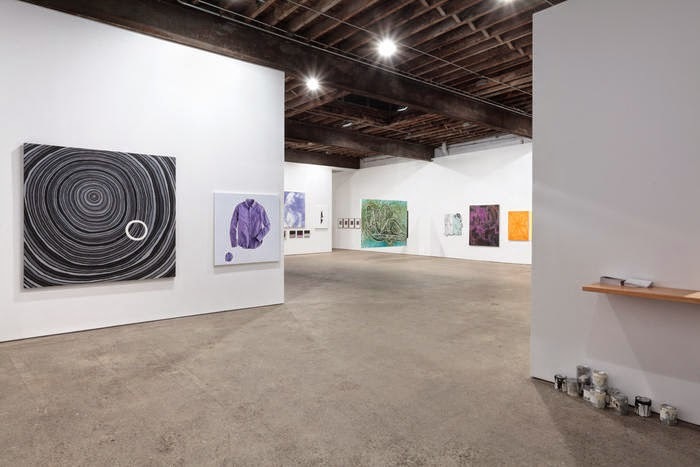 In contrast, “The Painter of Modern Life,” a group show organized by Bob Nickas at Anton Kern, is a visual essay that seems to focus directly on the mind space created when we are on the Internet. 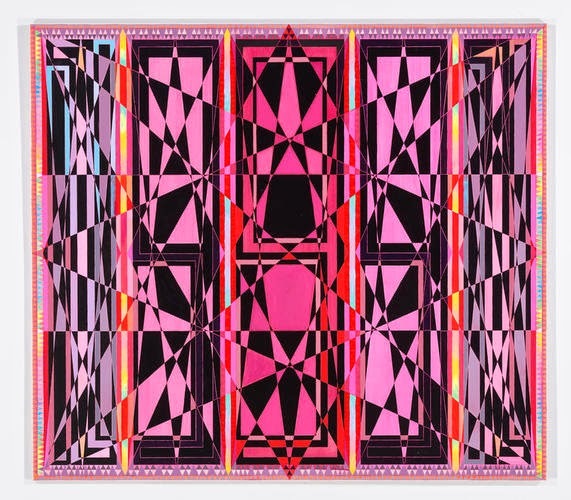 Many of the artists in this show may still refer to art historical-materials found on the web, but what makes their work so distinctive is their effort to visualize how it feels to spend so much time in a virtual world. 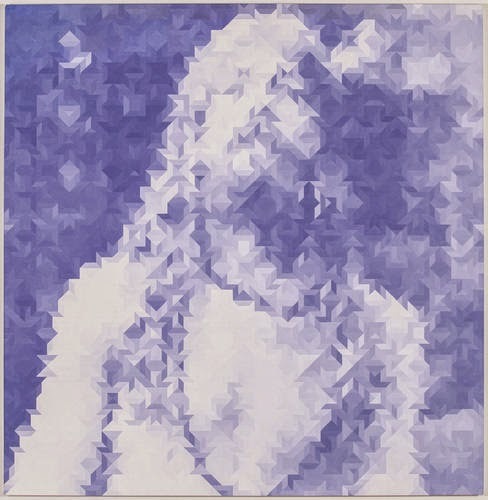 [Image at top: Mathew Cerletty, True Believer, 2013, oil on linen, 17 x 17 inches. 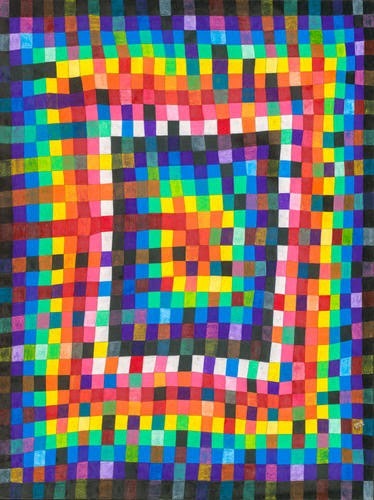 Richard Tinkler, Book Three Volume Two Page Seven, 2014, colored pencil on paper, 28 3/4 x 22 3/4 inches. For several years, scientists have been studying the effects of Internet use on our brains, and as anyone with a smart phone loaded with Instagram and Twitter and Facebook will admit, social media is addictive. We have a love/hate relationship with our phones: we want to live in the real world, but we can’t stop checking e-world to see what’s happening. In the old days, painters used to stop and perhaps have a cigarette and assess new work. Now we step away from a new painting or sculpture and check our phones. How many “likes” did our latest post generate? Who’s posting what on Instagram? What’s going on in the wider world? These are increasingly important questions to us. But unlike smoking, which helped us slow down the process and focus on individual paintings, Twitter and the like distance our own critical faculty from the act of assessment. Time previously spent looking at our work is now devoted to scrutinizing tiny images of other people’s work or posting images of our own. Once satiated with external stimuli, and perhaps heartened by a few ‘likes,” we return to our own work with a new understanding of its strengths and weaknesses. 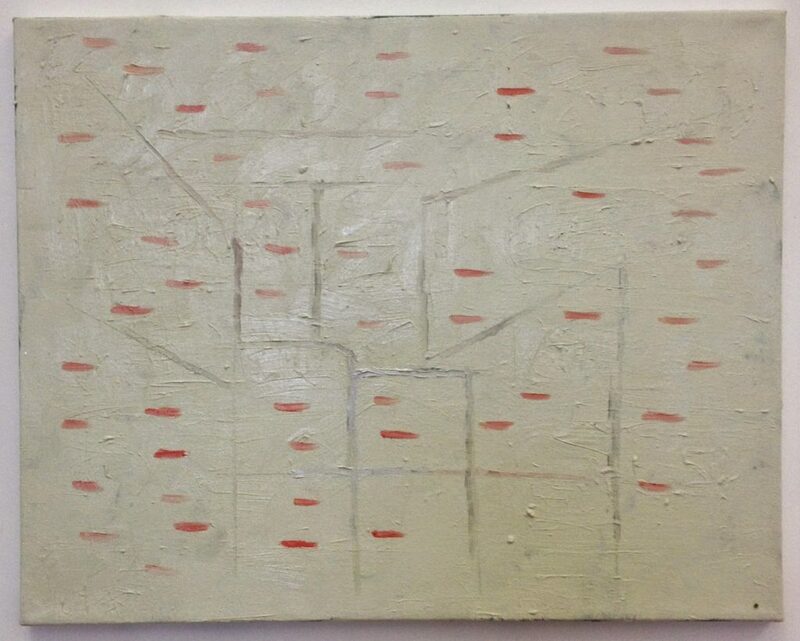 Daniel Hesidence, Untitled ( Summers Gun ), 2015, oil on canvas, 20 x 16 inches. Nicholas Carr’s 2011 Pulitzer-shortlisted book The Shallows: What the Internet is Doing to Our Brains examines this development. On account of our enthusiastic entanglement in the World Wide Web over the previous fifteen years or so, he suggests, although we have become adept at cursory reading, thinking processes have become hurried and distracted, and learning superficial. 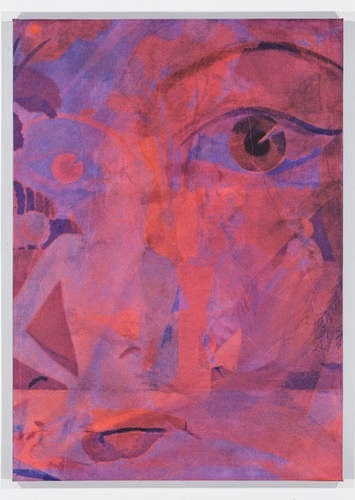 Whereas Hoptman’s exhibition considers how artists use the Internet, what interests me (and I think Bob Nickas) are the painters – call them web-heads – who recognize the erosion of deliberateness and contemplation in the artistic process that the Internet has occasioned and, paradoxically, reflectively explore this new phenomenon in their work. 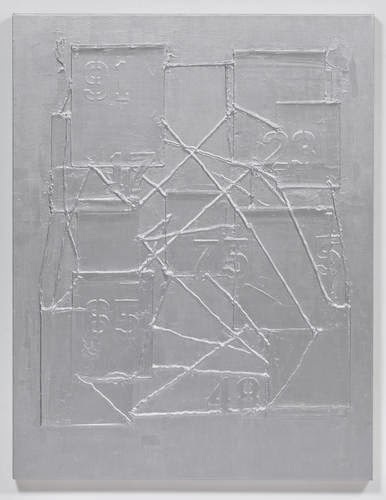 Cannon Hudson, Number Map, 2015, aluminum, Acrylic, Latex, Caracole on canvas, 48 x 38 x 1 1/4 inches. Artists like Sascha Braunig, Cannon Hudson, Lisa Beck, and Nicolas Roggy are paying attention to how we use the Internet. Anyone who has ever lost five minutes gaping at the cell phone in the middle of a crowd knows what I’m talking about. There’s no command-z (the Mac’s keyboard command for “Undo”) to get these pieces of our lives back. A challenging question “the modern painter” might ask herself is whether it’s possible to create a limned equivalent for such an unnerving, seemingly irrepressible experience. 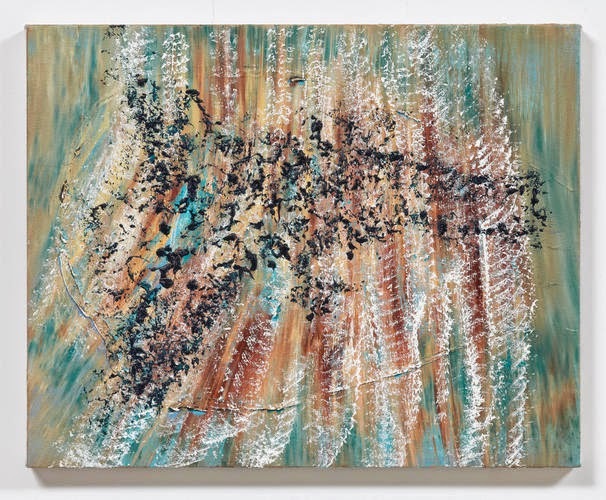 Sascha Braunig, Bottom Feeder, 2015, oil and acrylic on linen and wood, 20 1/2 x 16 inches. 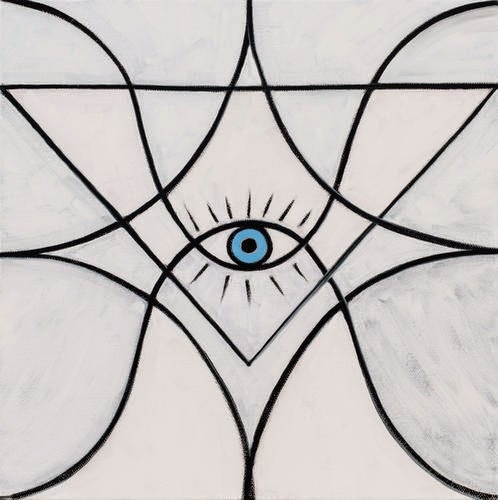 Lisa Beck, Untitled I (infra/silver), 2014, enamel paint on mirror mounted on wood, 12 x 12 inches. 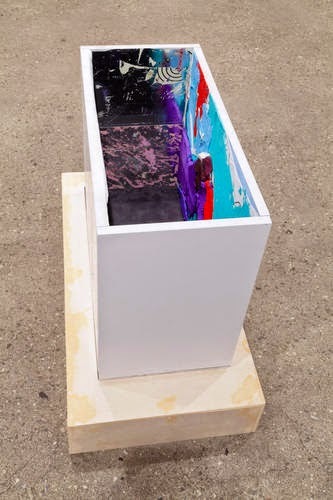 Nicolas Roggy, Untitled, 2015, pigment, acrylic, modeling paste, gesso on PVC, 27 x 22 x 13 inches. 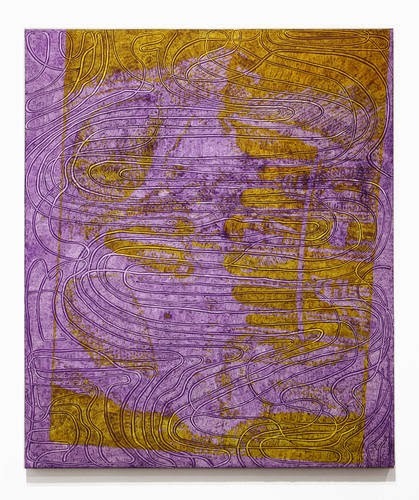 Nathaniel Axel, Aspects, 2015, inkjet on primed linen, 53 1/4 x 38 inches. 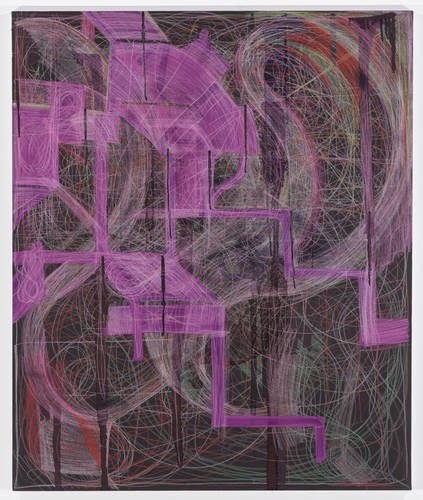 Xylor Jane, Untitled, 2015, oil on panel, 47 x 53 inches. As we adapt more thoroughly to the new reality of the Internet and social media, more painters will inevitably begin to explore the new form of consciousness that these tools have created. Given the elusively non-visual nature of the experience involved, there seems little doubt that abstraction will continue to be our primary language. 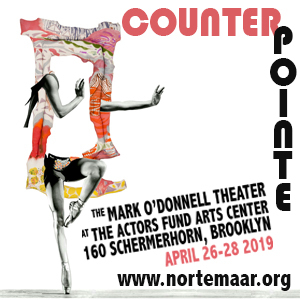 “The Painter of Modern Life,” organized by Bob Nickas. 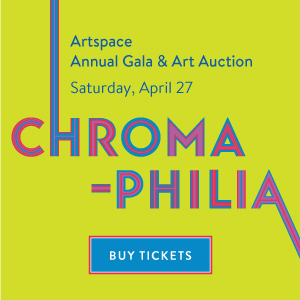 Artists include Nathaniel Axel, Lisa Beck, Sadie Benning, Sascha Braunig, Alex Brown, Mathew Cerletty, Wayne Gonzales, Joanne Greenbaum, Daniel Hesidence, Mamie Holst, Cannon Hudson, Chip Hughes, Xylor Jane, Robert Janitz, Erik Lindman, Nikholis Planck, David Ratcliff, Nicolas Roggy, Ivan Seal, Richard Tinkler, and Stanley Whitney. Anton Kern, Chelsea, New York, NY. Through April 11, 2015. NOTE: Parts of this post are taken from a statement I’m crafting about some new paintings, one of which is pictured below. The ideas will also be teased out in a curated one-night group exhibition with Improvised Showboat. 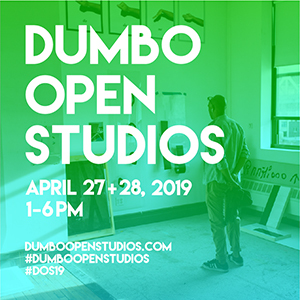 The exhibition is Saturday, May 2 at 55 Washington Street in DUMBO. Stay tuned for details! Sharon Butler, Vague Recollection, 2015, oil on canvas, 16 x 20 inches. I love your painting at the bottom of this post, best one of yours I've seen on the internet yet! Thanks Anon. I've gone back to oil paint so the work looks much different lately. 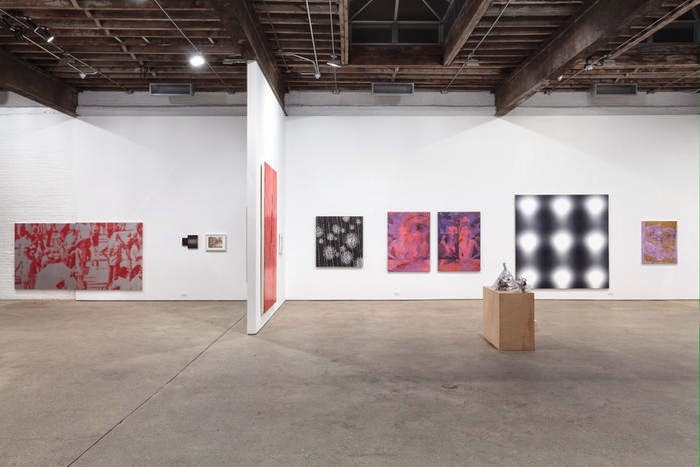 "In contrast, “The Painter of Modern Life,” a group show organized by Bob Nickas at Anton Kern, is a visual essay that seems to focus directly on the mind space created when we are on the Internet"